A mother ring-tail nursing her two babies at Anja Reserve. Photo by Lynne Venart. 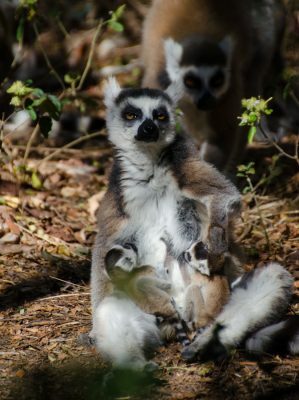 The mission of LCN member organizations working with ring-tailed lemurs has never been more urgent, following the publication of two independent studies estimating that there are only 2,000 – 2,400 ring-tailed lemurs (Lemur catta) left in the wild. This is a 95% decrease from the year 2000, when the last known population estimate was published. Ring-tailed lemurs are currently listed as Endangered on the IUCN Red List. 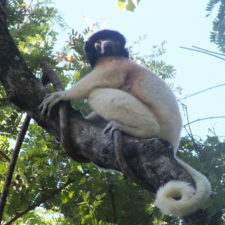 The two studies, one in Primate Conservation and the other in Folia Primatologica, were published by researchers from the LCN member organization Lemur Love as well as from the University of California San Diego, Duke University, Conservation International, the University of Victoria, and the University of Colorado Boulder. Ring-tailed lemurs are perhaps the most charismatic of Madagascar’s animals, and are a flagship species of the country. They can be seen in zoos around the world, including the zoos of the Lemur Conservation Network. 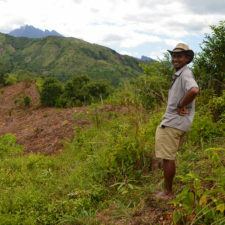 However, they are found only in southern Madagascar where their habitats are unfortunately disappearing. Ring-tailed lemurs face a series of threats, including habitat degradation, hunting, and the illegal pet trade; the Lemur Conservation Network has blogged about these threats before. For ring-tailed lemurs, the species is now limited to a series of restricted habitat patches. This means that male ring-tailed lemurs, which naturally move between different populations, are finding it harder to move safely to new groups. It has been estimated that 28% of lemurs kept as illegal pets in Madagascar are ring-tailed lemurs. 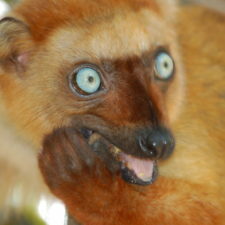 They are popular as pets in Madagascar as they are attractive to tourists and relatively easy to keep in captivity. The lemurs at the Dade City Wildlife Ranch. Based on the studies, several urgent conservation actions are recommended. First, the authors call for a complete census of all existing populations; this means going to all of the areas where ring-tailed lemurs are known to be found in the wild and doing a complete count of the number of individuals left. Second, the authors encourage a closer link between zoos and field-level conservation efforts, such as those being undertaken by LCN member organizations. Zoos play an important role in conservation because they can manage breeding programs, help support lemur conservation in the field, and be used to educate and inspire the public. Lastly, it is clear that things like hunting and the pet trade must be addressed if we want to protect ring-tailed lemurs in the wild. Many of the LCN member organizations are working on programs that provide ‘alternative livelihoods’, which are programs that help local communities become less dependent on forests for hunted food or wood, and doing outreach to combat illegal pet lemur ownership. In fact, the first nationwide outreach program against the illegal pet lemur trade was launched this last summer. Support good organizations doing good work! 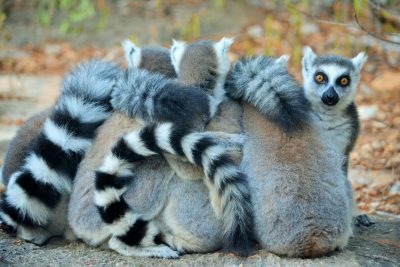 You can support the LCN member organizations that are working to conserve ring-tailed lemurs by donating resources that will help them with their mission. Want to make your support more targeted? 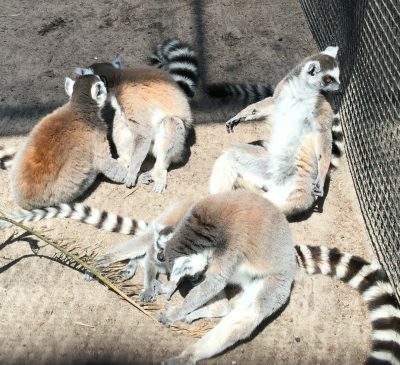 Then support Lemur Love, a non-profit organization that is working on a range of projects including: census of ring-tailed lemurs across their range, trying to use lemur poop to track the illegal trade of lemurs, and doing outreach to combat illegal pet lemur ownership. Spread the news to your friends using social media. The more people who know that ring-tailed lemurs are at risk, the better! Encourage your zoo to help the cause! More ring-tailed lemurs are now kept in zoos across the world than are found in the wild. It is important that your local zoo help support conservation causes. 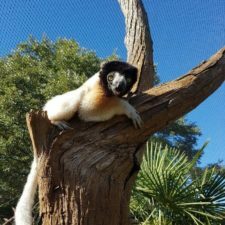 Encourage your zoo to hold ‘Lemur Days’ or to do other promotional events that raise awareness, and funding, for organizations doing work on the ground. Visiting Madagascar? Don’t take a selfie with a lemur! Ring-tailed lemurs in Madagascar are threatened by the illegal pet trade; they are often taken from the wild and kept as photo props for tourists who want to get their selfie with a lemur. By refusing to take a selfie with a lemur (or to pay to interact with lemurs in Madagascar) you are doing a great service to ensure that lemurs are kept where they belong…in the wild! Visit Lemur Love on Facebook, Twitter, on their website, and on their LCN profile! Spread the news on social media! Don’t take selfies with lemurs!